We’d love your help. Let us know what’s wrong with this preview of The Financial Crisis Inquiry Report by Financial Crisis Inquiry Commission. To ask other readers questions about The Financial Crisis Inquiry Report, please sign up. The report itself is a nice, comprehensive examination of what happened with the crisis, focusing on many of the antecedents (stretching all the way back to accumulated sovereign wealth in the late 1990s and Clinton-era housing policy). It includes lots of first-person perspectives, which is also informative. The main report (presumably drafted by the Democratic majority of the Commission) has two dissents. The first is by three Commission Republicans, and their point is that maybe the many, many The report itself is a nice, comprehensive examination of what happened with the crisis, focusing on many of the antecedents (stretching all the way back to accumulated sovereign wealth in the late 1990s and Clinton-era housing policy). It includes lots of first-person perspectives, which is also informative. The main report (presumably drafted by the Democratic majority of the Commission) has two dissents. The first is by three Commission Republicans, and their point is that maybe the many, many causes that the main report identifies are not all equally as important. Fair enough. They do, however, go on to present the ten (10) things they believe caused the crisis. The second, much longer dissent, is by Peter Wallison. I just started reading without figure out who this guy was. He starts by saying there was one, and only one, cause of the crisis-- US housing policy encouraging home ownership. Not anything else-- not capital inflows, not under regulated shadow banks, not securitization-- just housing policy. Weird, right? It seems like the consensus is that there multiple causes that converged to cause the crisis. A closer look, of course, reveals he is a fellow at the American Enterprise Institute. The free enterprise, personal liberty, rapidly anti-regulation conservative think tank. So I stopped reading there. I know I should not have, but I didn't think my mental state could handle 80 pages of anti-regulation propaganda. I enjoy economics and real estate, and this book was even too tedious for me. 550 pages in 8 point font that can be summarized with the statement, "Everyone was greedy." There's a lot of blame to go around; the crisis was caused by a number of interrelated events with greed as the cornerstone. While it is interesting reading despite being tedious, I'm positive that the reader could get the same information from a few journal articles. The book is the official report produced by the Financial Crisis Inquiry Commission on the financial crisis of 2007-2008. The book primarily provides a chronological history before, during, and briefly after the crisis. There are three different reports: one adopted by the majority i.e. 6 members of the 10 member commission which were chosen by the "Democratic leadership of Congress", which constitutes most of the book, and two separate dissenting reports adopted by 3 members and 1 member of the The book is the official report produced by the Financial Crisis Inquiry Commission on the financial crisis of 2007-2008. The book primarily provides a chronological history before, during, and briefly after the crisis. There are three different reports: one adopted by the majority i.e. 6 members of the 10 member commission which were chosen by the "Democratic leadership of Congress", which constitutes most of the book, and two separate dissenting reports adopted by 3 members and 1 member of the commission who were all chosen by the "Republican leadership of Congress." The majority report describes the various causes of the financial crisis in great detail as they happened, including inadequate corporate governance and oversight at financial institutions, a system which rewards short-term profit at all levels, and lax regulatory oversight of various financial institutions especially by the federal government. The 3 member dissenting report is similar to the majority report, except that it puts more emphasis on international factors which were not considered in detail in the majority report. The 1 member dissenting report puts the blame of the financial crisis primarily on government housing policy over the years, which facilitated reduced lending standards and encouraged the creation of toxic mortgages which the borrowers had no realistic ability to ever pay off. The majority report at almost 400 pages is at many points difficult to read because of the various financial terminology which are not adequately discussed in the text or in the glossary, but at other points reads like a novel because of the suspense created by the impending catastrophe at the more readable portions of the book. Also, the majority report could have been much more effectively focused by condensing it into fewer pages. The majority report sometimes reads like a laundry list of the various causes and events leading to the financial crisis. More analysis throughout the report could have led to a more focused and informative understanding of the crisis. Despite the excessive length of the report and lack of sufficient discussions of financial terminology, the report still provides a good overview of the causes of the financial crisis. In this respect, the 3 member dissenting report, because of its brevity, provides a very focused and to-the-point analysis of the causes of the financial crisis. This leads to a very clear understanding of the conclusions of the dissenting report. On the other hand, the 1 member dissenting report is somewhat biased in its opinion on the causes of the crisis, placing blame primarily on the government. It is hard to imagine that something as complex as the financial crisis could have been caused primarily by government policies. This commission member seems to be politically charged and wants to place blame on big government. In this respect, the other 9 commission members give a more balanced view. Lengthy official report on the financial crisis. It recounts the unfolding of events, which brought back many memories. It provides a generally balance view on the event and it's many causes with one massive exeception: the role of the GSEs (mainly Fannie Mae and Freddy Mac). As pointed out in the dissent by Peter Wallison (just read this dissent if you don't have time for all 662 pages), by mid 2008 out of 54 million mortgages in the US financial system, no less than 27 million were subprime or Lengthy official report on the financial crisis. It recounts the unfolding of events, which brought back many memories. It provides a generally balance view on the event and it's many causes with one massive exeception: the role of the GSEs (mainly Fannie Mae and Freddy Mac). As pointed out in the dissent by Peter Wallison (just read this dissent if you don't have time for all 662 pages), by mid 2008 out of 54 million mortgages in the US financial system, no less than 27 million were subprime or Alt-A! Out of these, 19 million (70%) were held or guaranteed by GSEs and only 8 million (30%) had been securitized as private label MBS (PMBS). By value, the GSE were directly responsible for 60% of subprime and Alt-A mortgages and PMBS accounted for only 40%. These statistics were virtually unknown to market participants and policy makers at the time. The much bigger size of this market explains why the price drop on its unwinding was so strong. The goverment's policy to expand homeownership to people who could not afford it, was critical for the development of the subprime and Alt-A mortgage markets and their ultimate size. When lending finally ground to a halt, it had disastrous consequences. The other dissent by three members of the committee argues that global financial flows were also to blame for the crisis, but fails to mention the low U.S. savings rate, making it read like a let's-blame-the-abroad-too dissent. The back cover notes that the report "exposes the facts, unravels myths and draws striking conclusions" about "the most devastating financial and economic crisis since the Great Depression." All that in a succinct 450 pages including over 2250 footnotes! The book is gripping reading - a litany of missed opportunities to prevent the crisis. But sadly many of those pointing out the problems were pilloried, ridiculed or fired. Too many people turned a blind eye to outright fraud in mortgage applica The back cover notes that the report "exposes the facts, unravels myths and draws striking conclusions" about "the most devastating financial and economic crisis since the Great Depression." All that in a succinct 450 pages including over 2250 footnotes! The book is gripping reading - a litany of missed opportunities to prevent the crisis. But sadly many of those pointing out the problems were pilloried, ridiculed or fired. Too many people turned a blind eye to outright fraud in mortgage applications with the excuse that "everyone else was doing it". At one bank problems persisted because of "delayed investment decisions and a desire to have business lines operate autonomously". For many banks business models could "not keep up" with the changes in the market. Other banks had "little accountability for errors" and "management had delayed fixing known deficiencies". This book should prove a sobering read of what can go wrong for those encountering similar issues in their own organisations. There is also an abundance of regulatory turf war and regulatory arbitrage by those being regulated. The report notes that those who made the decisions to oppose the CFTS's efforts to regulate derivatives - including Rubin, Summers and Greenspan - later testify that they were not opposed but could not surmount strong industry views! 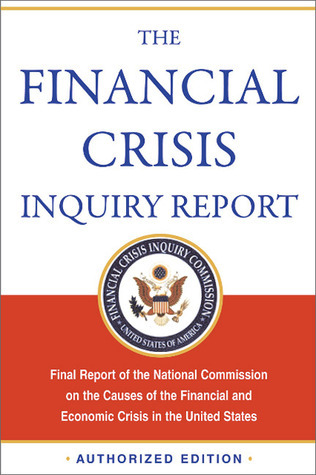 The report itself takes a very in-depth look at the events that happened during the financial crisis; it falls into the trap, however, of skimming over the possible causes of the crisis -- which should have been their main agenda -- and blaming most the issues on poor regulation and greed. There's a lot to be said about the factors that they do blame for causing the crisis (many are true), but the emphasis they placed on expanding on these points was to the detriment of their research into the o The report itself takes a very in-depth look at the events that happened during the financial crisis; it falls into the trap, however, of skimming over the possible causes of the crisis -- which should have been their main agenda -- and blaming most the issues on poor regulation and greed. There's a lot to be said about the factors that they do blame for causing the crisis (many are true), but the emphasis they placed on expanding on these points was to the detriment of their research into the other areas. I found the dissenting statements at the end of the book to be thought provoking, and it left me with the feeling this report could have been much more insightful had the commission used their resources properly and included a wider range of people. Still, it does a decent job of chronicling the main areas of the crisis. A well written book with fluent prose. It provides information on the historical decisions that laid the ground for the onslaught of the financial crisis, points out those responsible and attempts to describe the inter-relation between them. No easy bogeymen are used - but the ideology that advocates for unregulated and unfettered markets is strongly criticised, though no easy answers are given to the rebuttal that the private sector will always be one step ahead of the public sector in figuring A well written book with fluent prose. It provides information on the historical decisions that laid the ground for the onslaught of the financial crisis, points out those responsible and attempts to describe the inter-relation between them. Well written report of the events of 2007 - 2008 with some follow through into 2010. The leadup to the crisis is well documented and the thoughts of participants with regard to the bankruptcy of Lehman is well chronicled. The report is written for a general audience and non-quantitative readers. My main gripe is that the footnotes are not hyperlinked to their appropriate citations for the Kindle edition. Also, the graphs provided in the AEI dissenting statement are not formatted for optimum viewi Well written report of the events of 2007 - 2008 with some follow through into 2010. The leadup to the crisis is well documented and the thoughts of participants with regard to the bankruptcy of Lehman is well chronicled. The report is written for a general audience and non-quantitative readers. Not as readable as the 9/11 report (which I recommend) and doesn't go a good job of explaining the arcane technical details. A bit too detailed at times, I did a lot of skimming. I did learn some things about the financial crisis, but I hope this is not the definitive history. Recommended only for financial news junkies! I FINALLY finished this thing! it starts off like a dime store detective novel. it becomes dry in the center but finishes strong. The dissenting opinion at the end is a great counterpoint that lends balance and perspective to the financial industry bashing that permeates most of the book. A must read! Necessary reading for those interested in digging deeper into the archeology of the financial crisis...that I'm begging to see as the "tipping point" for the end of the era of American economic super power status. We're not Greece...we're us. A smart person learns from their mistakes -- a wise person learns from the mistakes of others! I hope many people read this so we don't make the same mistakes. As others have said, lengthy and diving in more technical understanding than other reports on the crisis cover while still providing a large-scope view of events as they unfold. This is excellent. Select chapters from this book ought to be required reading for high-schoolers. An honest first appraisal. Opening chapter with the commissions several conclusions should be required high school reading. A must-read, and very readable. This report explains a lot of what happened and is invaluable to an intelligent understanding of the Financial free-fall.